The perfect pillow for your little one. Think naps, bedtime, travel. Just because it says toddler doesn't mean you can't use for taking a quick snooze. My daughter likes that she can take this in the car with us, she often falls asleep even on short drives to the grocery store so this comes in handy. I love that the cover is made from 100% organic cotton and is made in the USA, that makes me feel good. Wash after wash it stays clump free which is near impossible to find in a pillow. Now if the company will start to make grown up pillows I would be in heaven. 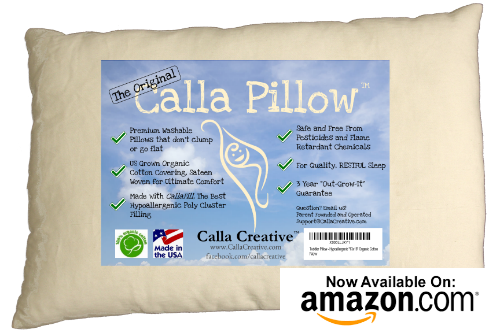 You can purchase the Calla Toddler Pillow on Amazon. 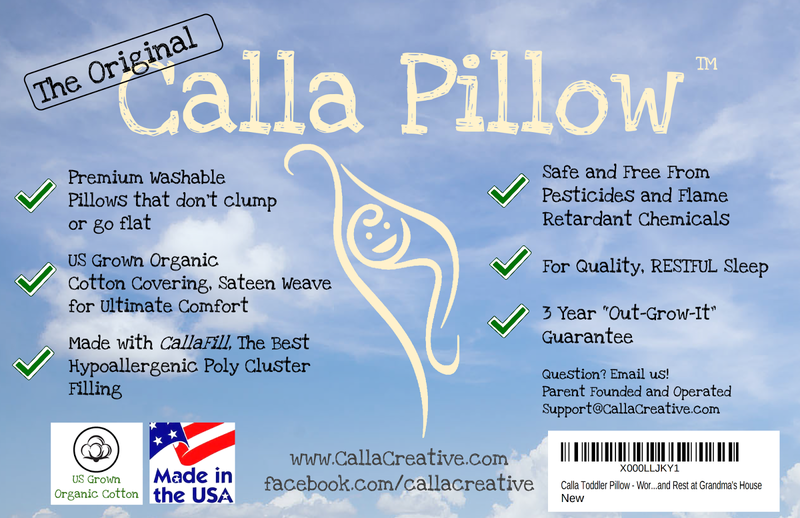 What Calla Creative has to say about their product. Best Washable Pillow for Toddlers, Covered in Soft Organic Cotton. Perfect for parents of toddlers who care about their children's health, supporting local businesses and who buy organic because of all the advantages like guaranteed no pesticides, chemicals or flame retardants. 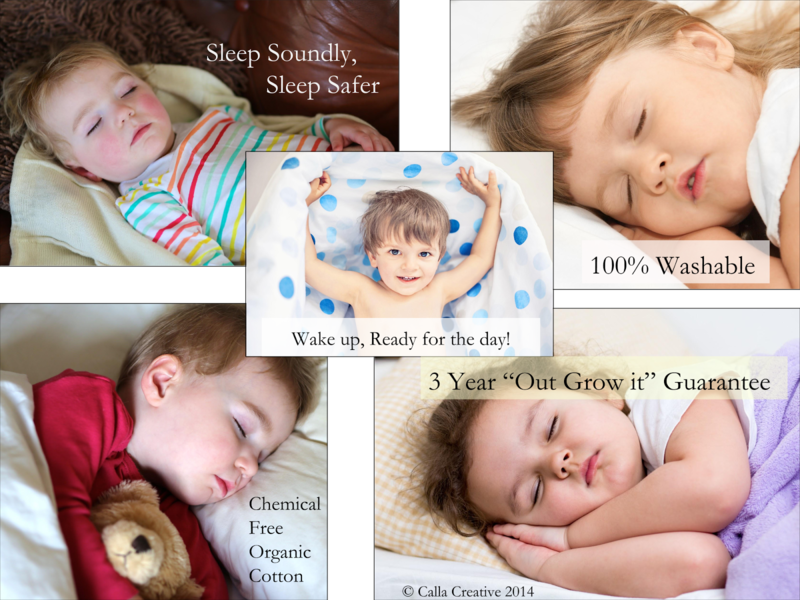 Founded by parents in 2014, Calla Creative set out to solve a frustrating problem in the children's bedding market. We needed a pillow that is washable. 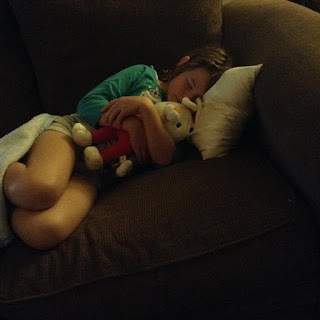 We'd heard stories from our friends about accidents, potty training, getting sick and all the other ways a kid needed a different pillow than we were able to find. 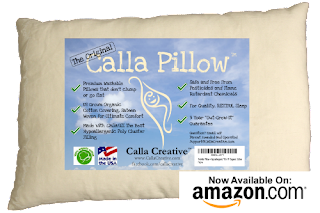 With all the time our daughter would spend next to her pillow, we also wanted a pillow that was guaranteed to have no flame retardant chemicals. Organic cotton is more durable, softer, Non-GMO, and Pesticide/Herbicide/Insecticides/Fungicide free. So we set out on our journey to craft an ideal pillow for her. We use a special kind of filling called CallaFill that's engineered to not clump or go flat after washed. It's Hypoallergenic and the best filling for toddlers bedding. One thing that sets our company apart from the "big guys" is that we offer a 3 year "Out-grow-it" Guarantee. It will last through many washes, story-times, dreams and puddles-of-drool. If for any reason your not happy with it, send us an email and we'll make it right. We love spending money with companies that really take care of their customers (like Nordstrom, Buy-Buy Baby, Bed Bath and Beyond and Target) and we aim to provide the same level of customer experience and satisfaction. Disclosure: MarksvilleandMe received one or more of the products mentioned above as part of a promotion with Tomoson and Calla Creative. Regardless, MarksvilleandMe only recommends products or services we use personally and believe will be good for our readers. Some of the links in the article may be “affiliate links.” This means if you click on the link and purchase the item, I will receive compensation. If you would like MarksvilleandMe to review a product or service please contact us at marksvilleandme@gmail.com.